Scaffolds for tissue engineering need to recapitulate the complex biochemical and biophysical microenvironment of the cellular niche. Here, we show the use of interfacial polyelectrolyte complexation fibers as a platform to create composite, multi-component polymeric scaffolds with sustained biochemical release. Cutiongco, M. F., Teo, B. K., Yim, E. K. Composite Scaffolds of Interfacial Polyelectrolyte Fibers for Temporally Controlled Release of Biomolecules. J. Vis. Exp. (102), e53079, doi:10.3791/53079 (2015). Various scaffolds used in tissue engineering require a controlled biochemical environment to mimic the physiological cell niche. Interfacial polyelectrolyte complexation (IPC) fibers can be used for controlled delivery of various biological agents such as small molecule drugs, cells, proteins and growth factors. The simplicity of the methodology in making IPC fibers gives flexibility in its application for controlled biomolecule delivery. Here, we describe a method of incorporating IPC fibers into two different polymeric scaffolds, hydrophilic polysaccharide and hydrophobic polycaprolactone, to create a multi-component composite scaffold. We showed that IPC fibers can be easily embedded into these polymeric structures, enhancing the capability for sustained release and improved preservation of biomolecules. We also created a composite polymeric scaffold with topographical cues and sustained biochemical release that can have synergistic effects on cell behavior. Composite polymeric scaffolds with IPC fibers represent a novel and simple method of recreating the cellular niche. The extracellular matrix has inherent biochemical and biophysical cues that direct cell behaviors. Mimicking this physiological three-dimensional (3D) microenvironment is a widely explored strategy for regenerative medicine and tissue engineering applications. For example, both naturally-derived and synthetic substrates have been modified with topographical cues as a means to mimic the biophysical cellular environment.1 For example, polycaprolactone (PCL) scaffolds can be easily patterned by casting on patterned PDMS substrates.2 However, most synthetic scaffolds inadequately recapitulate the controlled biochemical environment in vivo. Bulk or surface modification of synthetic materials only present biochemical cues for cell attachment but still lack temporal regulation of biochemical delivery.3 Thus, there is a need for optimal scaffolds that can mimic the temporally regulated biochemical delivery system of the extracellular matrix. Biochemical delivery systems such as microspheres are plagued by problems of loss of bioactivity and low incorporation efficiency due to the severity and complexity of multi-step synthesis process.4-6 Alternative methods that use a one-step fabrication and incorporation method were proven to have excellent potential to create a favorable biochemical microenvironment without the accompanying inefficiency in incorporation and loss of bioactivity. One viable solution is the use of interfacial polyelectrolyte complexation (IPC) fibers to deliver and protect biological agents. When two oppositely charged polyelectrolyte aqueous solutions are brought together, IPC fibers can be drawn out from the interface. Virtually any type of hydrophlic biomolecule in aqueous solution can be added into either the negatively- or positively-charged polyelectrolyte solution, thus facilitating the incorporation of useful biomolecules into the IPC fiber during the complexation process. Furthermore, this process only requires aqueous and ambient conditions, thereby decreasing the risk of loss of bioactivity. Using this method, active growth factors2,7 even cells8,9 have been successfully delivered. In addition, the simple method of forming IPC fibers allows molding into any shape or orientation. The stability of such fibers has been advantageous in its incorporation into both hydrophobic2 and hydrophilic polymers7 to create composite scaffolds. These composite scaffolds with IPC fibers are beneficial for creating a physiologically relevant biochemical environment while providing physical anchorage for cells. In this study, we show a method to incorporate IPC fibers into a hydrophilic and a hydrophobic scaffold with topography for controlled release of active biomolecules. As a proof-of-concept, we incorporate IPC fibers made from chitosan and alginate into the biocompatible, non-immunogenic and non-antigenic pullulan-dextran hydrophilic hydrogel or the biocompatible polycaprolactone hydrophobic scaffold. Purify chitosan, as detailed in Liao et al. Briefly, create a 1% (w/v) solution of chitosan in 2% (v/v) acetic acid and vacuum filter using grade 93 filter paper. Neutralize the filtrate using 5M NaOH until the pH stabilized to 7. Centrifuge the precipitated chitosan at 1,200 x g for 10 min. Decant the supernatant and add deionized water to wash the chitosan. Repeat the centrifugation and washing step two more times. Freeze the precipitated chitosan at -80 °C and lyophilize O/N to obtain the purified form. Store purified chitosan in a dehumidified cabinet. Weigh out 1 g of purified chitosan into a sterile tissue culture dish. Place the chitosan in the tissue culture dish as close as possible to the UV lamp in the biological safety cabinet and expose to UV light for 15 min. Using sterile forceps, place the sterilized chitosan into a glass container. Dissolve chitosan using filtered 0.15M acetic acid to a final concentration between 0.5% and 1% (w/v). Weigh out 0.1 g of alginic acid sodium salt and dissolve in 10 ml distilled deionized (DDI) water to obtain a 1% (w/v) solution. Mix the alginic acid sodium salt for at least 2 hr on the vortex mixer to ensure complete dissolution. Filter the alginate solution through 0.2 µm syringe filter. Store the alginate solution at 4 °C. Reconstitute human recombinant growth factors such as vascular endothelial growth factor (VEGF) or beta - nerve growth factor (NGF), as recommended by manufacturer. Mix proteins, growth factors or other biomolecules into 10-20 µl aliquot of the polyelectrolyte solution that has a similar net charge. Biological molecules with net negative charge (eg bovine serum albumin [BSA]) should be mixed with alginate solution. Biological molecules with net positive charge (eg VEGF) should be mixed with chitosan solution. Place small aliquots (10-20 µl) of chitosan and alginate on a stable flat surface that is covered with parafilm. The droplets of chitosan and alginate should be placed in close proximity but not in contact with each other. Lightly dip each tip on a pair of forceps into the chitosan and alginate droplets. Bring the droplets of polyelectrolytes together by pinching the forceps. When the droplets come into contact with each other, slowly pull the forceps vertically upward to draw the IPC fiber from the interface of the two droplets (Figure 1A). To determine incorporation efficiency, collect all the remaining liquids left on the parafilm by diluting with 500 µl of 1X phosphate buffered saline (PBS). Measure the protein or growth factor content in the residue through BCA assay (for BSA), ELISA (for VEGF and NGF) or an appropriate assay to detect incorporated biomolecule. Weigh out pullulan polysaccharide and mix with distilled deionized (DDI) water to create a 20% (w/v) aqueous solution. Mix the pullulan solution O/N to ensure homogeneity. Cast 15 g of pullulan solution into a 10 cm diameter tissue culture polystyrene (TCPS) dish. Dry the pullulan solution O/N at 37 °C. Cut the pullulan films into 7 mm x 7 mm square frames. Create a 30% (w/v) solution of the polysaccharides pullulan and dextran (3:1 ratio) in DDI water. Mix O/N to ensure homogeneity of the polysaccharide solution. Slowly add in sodium bicarbonate to the polysaccharide solution to achieve a final concentration of 20% (w/v). Mix O/N to ensure homogeneity of the solution. Store the polysaccharide solution at 4 °C. Affix the sacrificial pullulan frame (section 3.1) using an alligator clip. Stick the alligator clip and pullulan frame on the end of the rotating mandrel using plastic-coated adhesive tape. Rotate the mandrel with the affixed frame at a constant speed of 10 mm/sec. The pullulan frame can be affixed onto the rotating mandrel in desired orientations. Draw the IPC fibers using a pair of forceps (section 1) and attach the drawn end of the IPC fibers onto the rotating pullulan frame. Draw the IPC fibers at a constant speed. Upon reaching the terminal end of the IPC fiber, dry the fibers-on-frame construct O/N at RT. To crosslink every gram of pullulan-dextran solution, add 100 µl of 11% (w/v) sodium trimetaphosphate aqueous solution and 100 µl 10M sodium hydroxide.7 Mix the solution at 60 rpm using a stirplate for 1 to 2 min. After the addition of sodium trimetaphosphate and sodium hydroxide, the polysaccharide solution will crosslink almost immediately. Pour the viscous polysaccharide solution onto the fibers-on-frame construct to fully embed the IPC fibers. Incubate the combined pullulan-dextran-IPC fibers (PD-IPC) at 60 °C for 30 min to form a chemically crosslinked composite scaffolds (Figure 1B). CAUTION: Perform step 3.3.2 in the fume hood and use proper protective equipment as acetic acid is a corrosive and flammable. To induce pore formation in the PD-IPC scaffold, submerge the whole scaffold in 20% (w/v) acetic acid for 20 min. Remove unreacted reagents by washing PD-IPC scaffolds in 1X PBS for 5 min while shaking at 100 rpm. Repeat this step 2 times. Remove the excess PBS and immediately freeze the PD-IPC scaffolds at -80 °C O/N. Lyophilize the scaffolds at least 24 hr before use in any controlled release or bioactivity assays. CAUTION: Dichloromethane is a hazardous material. Use the fume hood and personal protective equipment when handling dichloromethane. Affix the sacrificial PCL frame with hole (from 4.2.1) on an alligator clip. Stick the alligator clip onto the rotating mandrel by using plastic-coated adhesive tape. Attach the drawn end of the IPC fiber onto the PCL frame before starting the rotation at a constant speed of 10mm/sec (section 2). After the end of IPC fiber drawing, dry the fiber-on-frame construct O/N at 4 °C. Drop 500 µl of 0.9% PCL solution onto the PDMS substrate to create a pristine or patterned PCL base, as required. Cast multiple layers of 0.9% PCL solution to obtain a scaffold with the desired thickness. Allow all of the dichloromethane solvent to fully evaporate in the fume hood. Place the fiber-on-frame construct (section 4.3.1) on top of the PCL base. Add 0.9% PCL solution on the fiber-on-frame construct multiple times to get the desired thickness and fully embed the IPC fibers, fabricating a PCL-IPC composite scaffold (Figure 1C). Place composite PD-IPC or PCL-IPC scaffolds and stand-alone IPC fibers separately in a 24-well plate. Immerse the scaffold and stand-alone IPC fibers with 500 µl of 1X PBS. Incubate the samples at 37 °C. Collect PBS at various time points (release media) and replace with 500 µl of 1X PBS. Measure the amount of protein or growth factor in the release media using a BCA assay (BSA), ELISA (VEGF and NGF) or other appropriate assay to calculate the cumulative release profile for the incorporated biomolecule. Sterilize the lyophilized PD-IPC or PCL-IPC composite scaffolds using UV light in the biological safety cabinet for at least 20 min. Use standard cell culture techniques to obtain a cell suspension of 2 x 105 cells in 200 µl growth media. Seed the concentrated cell suspension onto the composite scaffolds. After 20 min, top-up the volume of growth media to fully submerge the scaffolds. Measure cell activity through standard techniques such as Alamar blue metabolic activity assay, PC12 neurite outgrowth assay or immunofluorescence. In this article, we sought to create composite scaffolds with IPC fibers for the sustained release of various biomolecules. Characteristics of the biomolecules used in this study are found in Table 1. IPC fibers were first embedded into a hydrophilic PD hydrogel to create a PD-IPC composite scaffold (Figure 1B). Model molecule BSA was first tested to determine the feasibility of using a composite scaffold for controlled biomolecule release. BSA was incorporated into PD-IPC scaffolds with an efficiency of 45 ± 0.97%. BSA released from the PD-IPD showed near-linear kinetics with an initial attenuated burst release followed by a concomitant steady state (Figure 2). After 2 months, BSA achieved a total release of 97%. In contrast, standalone IPC fibers exhibited a rapid release of 80% of BSA within 4 hr. Next, we checked the release profile and bioactivity of VEGF using PD-IPC scaffolds. VEGF was incorporated with an efficiency of 75.5 ± 2.7%, and showed a sustained release for at least 1 week (Figure 3A). Human umbilical vein endothelial cells (HUVECs) were seeded on the PD-IPC scaffolds to determine the bioactivity of VEGF. 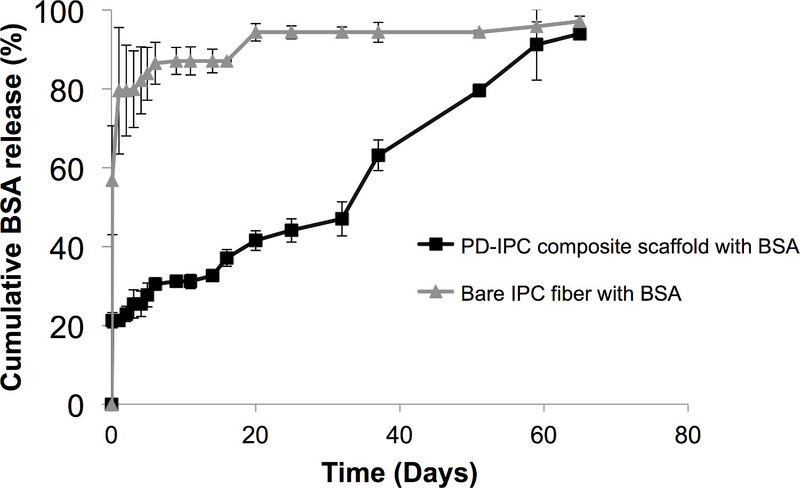 HUVECs on the PD-IPC scaffolds showed a significant increase in Alamar blue reduction and metabolic activity compared with plain PD scaffolds at day 1, indicating good preservation of VEGF function after being released from PD-IPC scaffolds (Figure 3B). Alamar blue reduction at days 3, 6 and 7 decreased to achieve comparable levels with the plain PD scaffold (Figure 3B). The PCL-IPC composite scaffolds were also tested for controlled release and compared with standalone IPC fibers. We incorporated NGF as a representative molecule into the PCL-IPC composite scaffolds with an incorporation efficiency of 66.38 ± 2.71%. PCL-IPC composite scaffolds showed linear sustained release and approximately 80% cumulative release after 18 days (Figure 4A). On the other hand, IPC stand-alone fiber showed a 70% burst release within 24 hr followed by a stagnant release rate. Using a PC12 neurite outgrowth assay, we examined the bioactivity of the released NGF (Figure 4B). The neurite outgrowth of PC12 cells grown on PCL-IPC composite scaffold release media showed similar levels with PC12 cells cultured in 30 ng/ml NGF supplemented media. This indicates that the released NGF remained bioactive for at least 7 days. Combination of topography and sustained growth factor delivery may mimic the cellular microenvironment better. 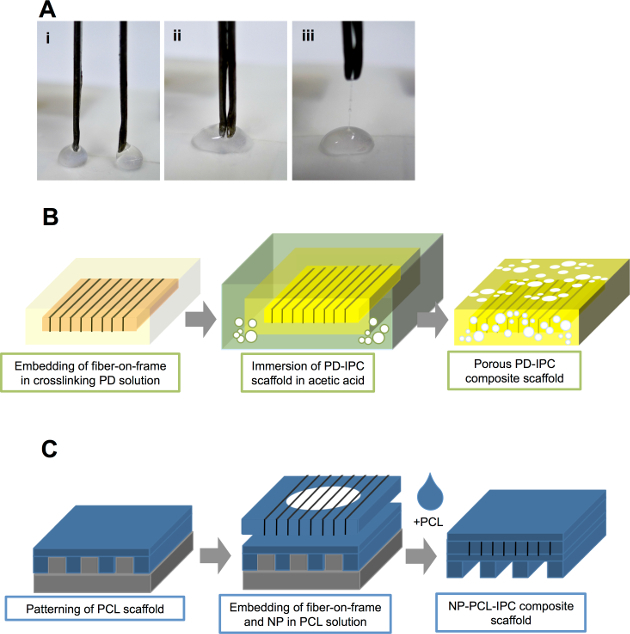 The versatile methodology of PCL-IPC fabrication allowed the fabrication of a biochemically- and topographically-controlled composite scaffold. We fabricated a PCL-IPC composite scaffold with nano-sized gratings structure (NP-PCL-IPC scaffold). We observed the synergistic effect of topography and sustained NGF release by assessing neuronal differentiation of human mesenchymal stem cells (hMSCs) (Figure 5). 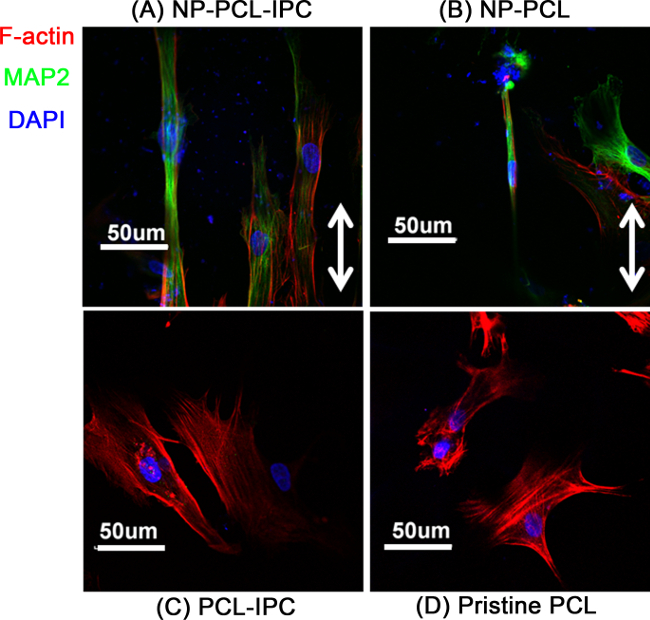 hMSCs cultured on the NP-PCL-IPC composite scaffolds showed higher expression of the Microtubule associated protein 2 (MAP2), indicative of neuronal differentiation. On the other hand, MAP2 protein expression was substantially lower in hMSCs cultured on PCL-IPC with only NGF release or patterned PCL (NP-PCL). Figure 1. Incorporation of IPC fibers into hydrophilic and hydrophobic scaffolds. (A) Drawing of IPC fibers at the interface of positively (chitosan) and negatively (alginate) charged polyelectrolyte solutions. (B) Schematic diagram showing incorporation of IPC fibers in hydrophilic PD solution to create PD-IPC composite scaffold. (C) Schematic diagram showing incorporation of IPC fibers in hydrophobic PCL scaffold to create PCL-IPC composite scaffold. This figure is adapted from Cutiongco et al., 2014.7 Please click here to view a larger version of this figure. Figure 2. Controlled release of BSA from PD-IPC composite scaffold. BSA was incorporated into PD-IPC composite scaffolds and its release was measured at various time points using BCA assay. Cumulative BSA released is provided as a percentage of the total amount of BSA (in µg) incorporated in the IPC fibers and are presented as mean percentage ± standard deviation. This figure is adapted from Cutiongco et al., 2014.7 Please click here to view a larger version of this figure. Figure 3. Controlled release and bioactivity of VEGF from PD-IPC composite scaffold. (A) Cumulative release profile of VEGF from PD-IPC composite scaffolds. VEGF release was measured at various time points using ELISA specific for VEGF. (B) Cell viability of endothelial cells grown on PD-IPC composite scaffolds, as measured by Alamar blue metabolic assay. Statistical analysis was performed using one-way ANOVA with Tukey’s post-hoc test. *denotes p < 0.05. This figure is adapted from Cutiongco et al., 2014.7 Please click here to view a larger version of this figure. Figure 4. Controlled release and bioactivity of NGF from PCL-IPC composite scaffold. (A) Cumulative release profile of NGF from PCL-IPC composite scaffolds. NGF release was measured at various time points using ELISA specific for NGF. Insert shows cumulative release profile of NGF from PCL-IPC scaffold for the first 8 hr. (B) Bioactivity of NGF as measured by outgrowth of PC12 neural cells. PC12 outgrowth was measured through image analysis. This figure is adapted from Teo et al., 2014.2 Please click here to view a larger version of this figure. Figure 5. Differentiation of hMSC on NP-PCL-IPC scaffold. Confocal scanning microscopy image of hMSC cultured on different composite scaffolds. (A) NP-PCL-IPC, (B) NP-PCL, (C) PCL-IPC, (D) Pristine PCL scaffolds. Green stain denotes MAP2, a neuronal lineage marker. Red stain denotes F-actin, showing the cellular cytoskeleton. Blue stain denotes the nucleus. This figure is adapted from Teo et al., 2014.2 Please click here to view a larger version of this figure. Table 1. Characteristics of biochemicals used for controlled release from composite IPC scaffolds. IPC fibers are formed by the interaction of two oppositely charged polyelectrolytes. The process utilizes the extraction of the complex from the interface of the polyelectrolytes, facilitating a self-assembly process for stable fiber formation. The mechanism of IPC fiber formation ensures that any biomolecule added into a similarly charged polyelectrolyte can be incorporated during the complexation process.10,11 Conversely, addition of a biomolecule into the oppositely charged polyelectrolyte will result in instantaneous precipitation. The simple fabrication methodology for IPC fibers lends versatility in incorporating various biological materials such as cells, growth factors and small molecules. This critical feature of IPC fibers was also observed in both the PD-IPC and PCL-IPC composite scaffolds, where growth factors with different physical and biomolecular properties (charge and molecular weight) were incorporated with high efficiency. In contrast, encapsulation efficiency using microsphere methodologies for VEGF and NGF can be as low as 16%6 and 8%13, respectively. Both PD-IPC and PCL-IPC scaffolds also demonstrated temporal control of biomolecule release. VEGF from PD-IPC scaffolds showed linear release for at least 7 days. In contrast, reported VEGF release profiles from polymeric microspheres showed an initial burst release within 24 hr, releasing at least 60% of the total VEGF content.5,14,15 Similarly, NGF was shown to have sustained growth factor delivery from PCL-IPC scaffolds, while other polymeric-based growth factor delivery systems show a plateau of release from 20 days of release.13,16 Presumably, the different components of the composite scaffolds both contribute to growth factor release kinetics. Polymer relaxation mechanisms, porosity and tortuosity can greatly affect the release of hydrophilic biomolecules.17 In addition, the chemical characteristics of the polymeric scaffold may have electrostatic attraction and repulsion towards the growth factors that affects biomolecule release. Thus, the characteristics of the polymeric scaffold are critical in determining release profiles and biomolecules with temporally-controlled release. For instance, while the PD scaffold showed near-linear BSA release, a similar composite scaffold using poly(vinyl alcohol) hydrogel lacked permeability to BSA.18 Polymeric scaffolds that can be used in combination with IPC fibers may require preliminary testing to determine its permeability range. In addition to controlled biochemical release, the capacity to retain the bioactivity of growth factors is an important feature for any biomolecule delivery system. The harsh alkaline environment of the PD solution and the presence of organic DCM solvent in PCL have the potential to degrade any sort of biomolecules. For example, microsphere delivery system that used dichloromethane showed a consistent trend of diminishing bioactivity with increasing timepoint due to the degradation of NGF.16 Nonetheless, we observed that the bioactivity of VEGF and NGF is maintained, further reiterating that a key advantage of IPC fibers are assimilated within the composite scaffolds. Our presented methodology also permitted the fabrication of a scaffold with both topographical and biochemical cues. We observed that the NP-PCL-IPC scaffold had the highest enhancement of hMSC differentiation into the neuronal lineage, implying that mimicking multiple aspects of the biophysical and biochemical cellular niche is beneficial in directing cell behavior. The ease of the presented methodology permits its application to other patternable polymeric systems such as polyacrylamide21 or polyethylene glycol22, provided that the crosslinking process will not significantly affect IPC fiber integrity. For example, PD scaffolds were chosen in this study for its unique crosslinking mechanism that occurs in ambient and aqueous conditions.24 This can potentially provide more physiologically relevant substrates for in vitro and in vivo studies. In addition, embedding IPC fibers in a composite scaffold can overcome the lack of mechanical strength of IPC fibers23 by providing tensile strength. Indeed, PCL25 was chosen for its high mechanical strength. In summary, a simple method for creating composite scaffolds for biomolecule delivery was described. We demonstrated how IPC fibers can be used for sustained delivery of biomolecules without compromising its bioactivity and the incorporation efficiency. We showed this by creating composite scaffolds with two variations: PD-IPC and PCL-IPC scaffolds. Applicability of IPC fibers is not limited to incorporation in PD- and PCL-based scaffolds, but can be potentially extended to other polymeric systems and to deliver other biomolecules. This work was supported by the Singapore National Research Foundation administered by one of its Research Centers of Excellence, the Mechanobiology Institute, Singapore. MFAC is supported by the Agency for Science, Technology and Research (Singapore) and National Agency for Research (France) joint program under project number 1122703037. BKKT is supported by the Mechanobiology Institute. We thank Mr. Daniel HC Wong for proof-reading the manuscript and Ms. Dawn JH Neo for assisting in the video production. Pullulan Hayashibara Inc Okayama Japan Molecular weight (MW) 200 kDa. This material is pharmaceutical grade pullulan used to make pullulan frames and PD-IPC scaffolds. Dextran Sigma Aldrich D1037 MW 500 kDa. This material is no longer being produced by Sigma Aldrich. Alternative suggested is catalog number 31392 (Sigma Aldrich). This material is used to make PD-IPC scaffolds. Sodium Bicarbonate Sigma Aldrich S5761 Sodium bicarbonate must be slowly added to the pullulan-dextran polysaccharide solution. Rapid addition of sodium bicarbonate will result in precipitation. Sodium Trimetaphosphate Sigma Aldrich T5508 This chemical is hygroscopic and must be stored in the dehumidifying cabinet. Aqueous solution of sodium trimetaphosphate must always be made fresh. Sodium Hydroxide Sigma Aldrich S5881 This material is hazardous and must be handled with proper protective equipment such as nitrile gloves. Chitosan Sigma Aldrich 448877 MW 190-310 kDa. Acetylation degree of 75% to 85%. Purification of chitosan is required to create stable IPC fibers. Acetic Acid Merck This can be replaced by another brand type. This material is corrosive and flammable. Protective equipment such as face shield, nitrile gloves, lab coat and shoe cover must be worn when handling this chemical in the fume hood. Alginic acid sodium salt from brown algae, low viscosity Sigma Aldrich A2158 Dissolve in water overnight. Filter through sterile 0.2 µm syringe filter before use. Store at 4 °C. Bovine Serum Albumin Sinopharm Chemical Reagent Dissolve in sterile PBS and filter using 0.2 µm syringe filter before use. BCA assay kit Pierce 23225 This kit was used to measure BSA release from PD-IPC scaffolds. Human Recombinant Vascular Endothelial Growth Factor R&D systems 293-VE Dissolve growth factor in 0.2% heparin solution to a final concentration of 5 mg/ml. Heparin Sodium Salt From Porcine Sigma Aldrich H3393 This can be replaced by another brand type. Dissolve heparin salt in sterile water at a final concentration of 1% and filter through 0.2 µm syringe filter before use. 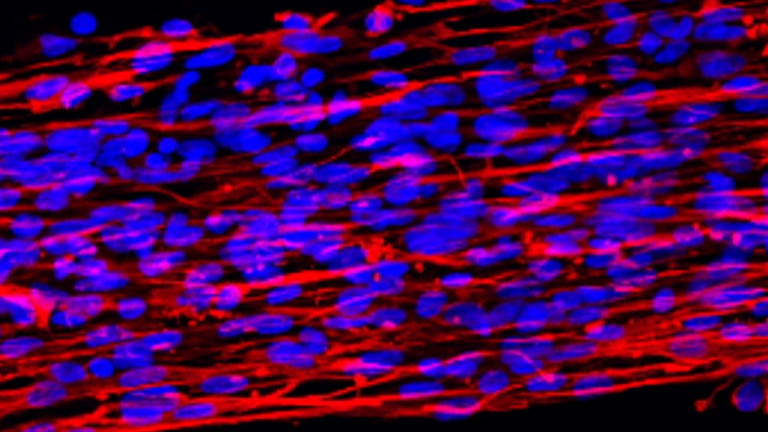 Human Umbilical Vein Endothelial Cells (HUVEC) Lonza C2517A This primary cell type was used in the assay to determine VEGF bioactivity after release from PD-IPC scaffolds. Alamar blue Life Technologies DAL1025 This is used to measure cell metabolic activity. Incubate Alamar blue with cells and maintain in standard cell culture conditions for 2 to 4 hours. Measure absorbance at 570 nm to determine Alamar blue percent reduction, which is correlated to the cell activity. ScanVac Coolsafe Lyophilizer Labogene 7.001.200.060 This is a non-programmable freeze dryer that operates at -105 to -110 °C. This can be replaced by other standard lab lyophilizers. Polycaprolactone (PCL) Sigma Aldrich 181609 MW 65 kDa. This is no longer being manufactured by Sigma Aldrich. This can be replaced by Sigma Aldrich catalog number 704105. Dichloromethane Sigma Aldrich V800151 This can be replaced by another brand type. This material is hazardous and must be handled in the fume hood. Protective equipment must be worn at all times when handling this chemical. Polydimethylsiloxane (PDMS; 184 Silicone Elastomer Kit) Dow Corning (240)4019862 The elastomer kit comes with polymer base and crosslinker. Mixing the polymer base and crosslinker in different ratios will result in different stiffness of the PDMS. Human Recombinant Beta-Nerve Growth Factor (NGF) R&D systems 256-GF Reconstituted in sterile DI water to a final concentration of 100 µg⁠/⁠ml. Aliquot and store in -20 °C until use. Human Mesenchymal Stem Cells (hMSC) Cambrex This cell type was used in the assay to determine synergistic effect of NGF and nanotopography. Rat PC12 Pheochromocytoma Cells ATCC This cell type was used in the neurite outgrowth assay to determine bioactivity of NGF. After exposure to release media with NGF, measure number of cells with neurite extensions and normalize to total number of cells. Grade 93 filter paper Whatman Z699675 This is used for the purification of chitosan after its precipitation with sodium hydroxide at pH 7. Swing bucket centrifuge Eppendorf 5810R To be used during the purification of chitosan using 1,200 x g speed. Motor with mandrel rotating at constant speed Rhymebus RM5E The motor is used for the fabrication of IPC fibers on pullulan or PCL frame. Phosphate buffered saline FirstBase Sterilize through filtration (0.2 µm filter) and autoclave. 10-mm diameter Tissue Culture Polystyrene Dish (TCPS) Greiner The TCPS dish is used for casting of pullulan frame. Human VEGF ELISA kit R&D systems DVE00 The ELISA kit is used for detection of VEGF in the release medium. Human NGF ELISA kit R&D systems DY256 The ELISA kit is used for detection of NGF in the release medium. Annabi, N., Tamayol, A., et al. 25th Anniversary Article: Rational design and applications of hydrogels in regenerative medicine. Adv. Mater. 26, (1), 85-124 (2014). Teo, B. K. K., Tan, G. D. S., Yim, E. K. F. The synergistic effect of nanotopography and sustained dual release of hydrophobic and hydrophilic neurotrophic factors on human mesenchymal stem cell neuronal lineage commitment. Tissue Eng. Part A. 20, (15-16), 2151-2161 (2014). Lee, K., Silva, E. A., Mooney, D. J. Growth factor delivery-based tissue engineering: general approaches and a review of recent developments. J. R. Soc. Interface. 8, (55), 153-170 (2011). Sun, Q., Chen, R. R., Shen, Y., Mooney, D. J., Rajagopalan, S., Grossman, P. M. Sustained vascular endothelial growth factor delivery enhances angiogenesis and perfusion in ischemic hind limb. Pharm. Res. 22, (7), 1110-1116 (2005). Rui, J., Dadsetan, M., et al. Controlled release of vascular endothelial growth factor using poly-lactic-co-glycolic acid microspheres: in vitro characterization and application in polycaprolactone fumarate nerve conduits. Acta Biomater. 8, (2), 511-518 (2012). King, T. W., Patrick, C. W. Development and in vitro characterization of vascular endothelial growth factor (VEGF)-loaded poly(DL-lactic-co-glycolic acid)/poly(ethylene glycol) microspheres using a solid encapsulation/single emulsion/solvent extraction technique. J. Biomed. Mater. Res. 51, (3), 383-390 (2000). Cutiongco, M. F. A., Tan, M. H., Ng, M. Y. K., Le Visage, C., Yim, E. K. F. Composite pullulan-dextran polysaccharide scaffold with interfacial polyelectrolyte complexation fibers: A platform with enhanced cell interaction and spatial distribution. Acta Biomater. 10, (10), 4410-4418 (2014). Yow, S. Z., Quek, C. H., Yim, E. K. F., Lim, C. T., Leong, K. W. Collagen-based fibrous scaffold for spatial organization of encapsulated and seeded human mesenchymal stem cells. Biomaterials. 30, (6), 1133-1142 (2009). Yim, E. K. F., Wan, A. C. A., Le Visage, C., Liao, I. C., Leong, K. W. Proliferation and differentiation of human mesenchymal stem cell encapsulated in polyelectrolyte complexation fibrous scaffold. Biomaterials. 27, (36), 6111-6122 (2006). Liao, I. C., Wan, A. C., Yim, E. K. F., Leong, K. W. Controlled release from fibers of polyelectrolyte complexes. J. Control. Release. 104, (2), 347-358 (2005). Wan, A. C. A., Liao, I. C., Yim, E. K. F., Leong, K. W. Mechanism of fiber formation by interfacial polyelectrolyte complexation. Macromolecules. 37, (18), 7019-7025 (2004). Yim, E. K. F., Reano, R., Pang, S., Yee, A., Chen, C., Leong, K. W. Nanopattern-induced changes in morphology and motility of smooth muscle cells. Biomaterials. 26, (26), 5405-5413 (2005). Sun, H., Xu, F., Guo, D., Yu, H. Preparation and evaluation of NGF-microsphere conduits for regeneration of defective nerves. Neurol. Res. 34, (5), 491-497 (2012). Simón-Yarza, T., Formiga, F. R., Tamayo, E., Pelacho, B., Prosper, F., Blanco-Prieto, M. J. PEGylated-PLGA microparticles containing VEGF for long term drug delivery. Int. J. Pharm. 440, (1), 13-18 (2013). Patel, Z. S., Ueda, H., Yamamoto, M., Tabata, Y., Mikos, A. G. In vitro and in vivo release of vascular endothelial growth factor from gelatin microparticles and biodegradable composite scaffolds. Pharm. Res. 25, (10), 2370-2378 (2008). Sun, H., Xu, F., Guo, D., Liu, G. In vitro evaluation of the effects of various additives and polymers on nerve growth factor microspheres. Drug Dev. Int. Pharm. 40, (4), 452-457 (2014). Lee, P. I. Kinetics of drug release from hydrogel matrices. J. Control. Release. 2, 277-288 (1985). Cutiongco, M. F. A., Choo, R. K. T., Shen, N. J. X., Chua, B. M. X., Sju, E., Choo, A. W. L., Le Visage, C., Yim, E. K. F. Composite scaffold of poly(vinyl alcohol) and interfacial polyelectrolyte complexation fibers for controlled biomolecule delivery. Front. Bioeng. Biotechnol. 3, (3), 1-12 (2015). Yow, S. Z., Lim, T. H., Yim, E. K. F., Lim, C. T., Leong, K. W. A 3D Electroactive Polypyrrole-Collagen Fibrous Scaffold for Tissue Engineering. Polymers. 3, (1), 527-544 (2011). Leong, M. F., Toh, J. K. C., et al. Patterned prevascularised tissue constructs by assembly of polyelectrolyte hydrogel fibres. Nat. Commun. 4, 2353 (2013). Di Benedetto, F., Biasco, A., Pisignano, D., Cingolani, R. Patterning polyacrylamide hydrogels by soft lithography. Nanotechnology. 16, (5), S165 (2005). Revzin, A., Russell, R. J., et al. Fabrication of poly(ethylene glycol) hydrogel microstructures using photolithography. Langmuir. 17, (18), 5440-5447 (2001). Yim, E. K. F., Liao, I. C. Tissue compatibility of interfacial polyelectrolyte complexation fibrous scaffold: evaluation of blood compatibility and biocompatibility. Tissue Eng. Part A. 13, (2), 423-433 (2007). Chaouat, M., Le Visage, C., Autissier, A., Chaubet, F., Letourneur, D. The evaluation of a small-diameter polysaccharide-based arterial graft in rats. Biomaterials. 27, 5546-5553 (2006). Eshraghi, S., Das, S. Mechanical and microstructural properties of polycaprolactone scaffolds with one-dimensional, two dimensional, and three-dimensional orthogonally oriented porous architectures produced by selective laser sintering. Acta Biomater. 6, 2467-2476 (2010).